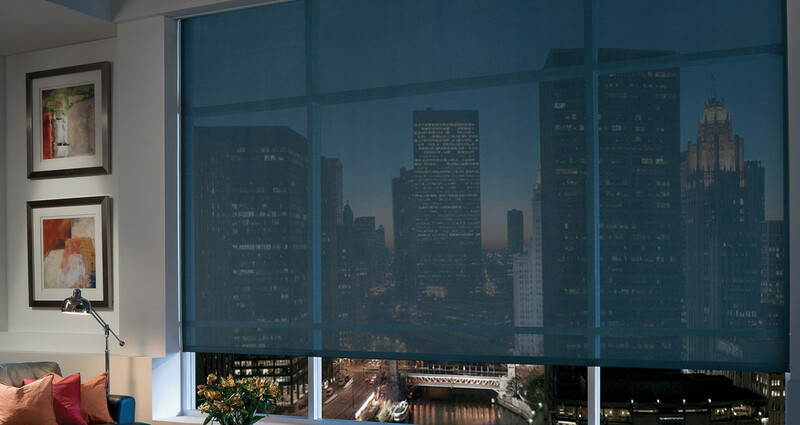 Fabric Roller Shades & Solar Screen Shades are an ideal combination of practicality and style. Their form and function are classically simple, yet their diverse array of fabrics and textures make a strong design statement. All of our shade styles add a degree of privacy, increase energy efficiency and help protect furnishings from the sun’s harsh rays. We are very proud to boast one of the largest selections of fabric and brand choices in the Greater Boston Area! What are the differences between Fabric Roller Shades and Solar Screen Shades? For excellent UV protection while maintaining your view of the outdoors, our translucent Screen Shades are available in sturdy and easy-to-clean fabrics. Screen shades are available in a variety of different opacities, from a 1% Openness for maximum heat control to a 25% Openness for the most uninhibited view. Solar Shades are also the perfect option as a roller shade for your patio or sunroom. Solar Shades can help you reclaim your outdoor space during those hot summer months without obstructing your view of the outdoors! Our Roller Shades combine the ease and simplicity of a roller shade with hundreds of fabric choices. 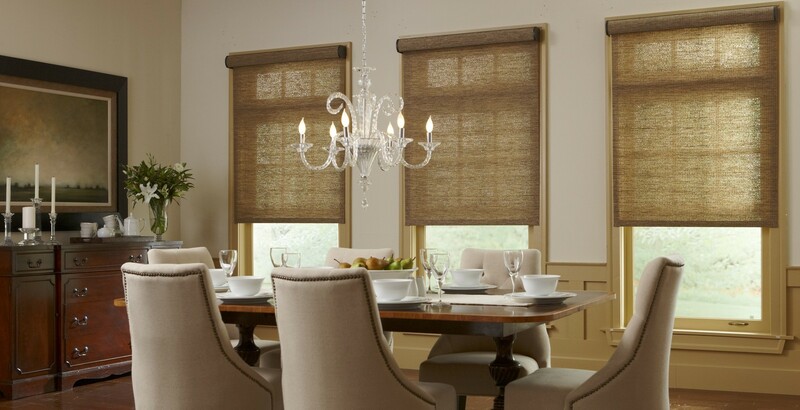 Choose from one of the largest selection of Roller Shade Fabric Collections in Boston. We have a variety of fabrics, ranging from simple Solid Colors to Elaborate Floral Patterns. 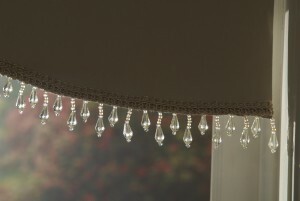 We offer fabrics that range in transparency from fully sheer to completely room darkening. When it comes to your fabric choices with us, the only limit is your imagination! What Options Do You Have For Lifting Your Shades? Our Cordless Lifting Option is not the old-fashioned Spring System you remember from being a kid at Grandma’s house. Our Cordless Lift System allows your Shades to open and close with the gentle pull of a bottom bar that unlocks the shade and allows it to raise slowly at it’s own pace. To lower the shade, simply pull the bottom bar down to lock the shade back into place. A far cry from the days when you pulled a ring and hoped that Grandma wouldn’t hear the shade flying upward at 80mph. For the ultimate ease of operation, our clutch control lets you operate the shade by pulling on a beaded chain to position the shade exactly where you want it. Don’t be fooled though, all clutches are NOT created equal, and many manufacturers will sacrifice on the quality of the shade clutch to be able to offer the shade at a lower price. This sacrifice will lead to shorted clutch life, and a much heavier pull force. At Shades IN Place, we only offer Clutches that have passed our rigorous tests for quality and that carry a solid warranty for our customers. In fact, we have made it our policy to refuse any manufacturer that offers anything less than a 5 Year Warranty on their clutch system. Have hard-to-reach windows and still want to control the sun? Our battery-operated or plug and play motorized lift system lifts and lowers your shades with the simple touch of a button. Motorized shades are also a great choice for homes with small children or pets, where cords can pose an unnecessary obstacle. Shades IN Place has worked hard to build our reputation as Experts in the field of Motorized Shades in Boston. For more information on our Motorization Services, click here! What Options Do You Have To Customize Your Roller Shades? 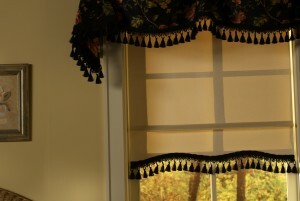 For a more traditional look, choose a Classic Fabric Valance to match the Fabric that you chose for shades! For a more Contemporary Look, Choose a sleek modern Fascia, in either a Painted Finish, a Stainless Steel, or even a Bronze Finish. For a cleaner, more finished look, you can hide the roller shade hardware under a sleek cassette headrail covered with a matching fabric insert. Our large cassette is available in a variety of colors to blend easily with our assortment of patterns. Keep large spans of windows looking clean and uniform by putting two roller shades on one continuous headrail. While they look like one shade, they operate independently, and keep the light gap in the center to an absolute minimum. Finish off the look of your custom roller shades with a fabric-wrapped or painted metal bottomrail. For a complete color match and a softer look, select our hemmed option which uses an aluminum bar heat sealed into a hemmed pocket along the bottom of the shade. 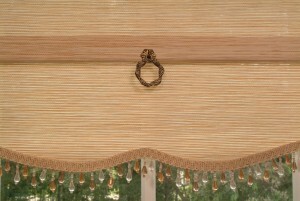 The regular roll option lets fabric roll off the back of the shade, hanging close to the window. This is our most popular option as it provide a nice separation between the valance and the shade fabric. The reverse roll option allows the fabric to roll off the front of the shade, hiding the fabric roll. this option works well when trying to clear an obstruction, such as window cranks, and also provides a nice waterfall effect, should you decide not to use a valance. The panel track configuration is an excellent option for covering sliding glass doors and extra wide windows. Sliding Panels have become a wonderful alternative to vertical blinds on Patio Doors. Add even more style and personality to your roller shades by adding one of our decorative hem designs or trim pattern accents. This is where you can truly let your imagination run wild. This level of customization is one of the things that truly sets us apart here in Boston! If you decide to go with our Clutch Control Lift System, our Metal Bead Chains are available in Antique Brass, Oil Rubbed Bronze, Stainless Steel and Nickel to complement most decors. Nothing says color coordination like matching your bead chain to the other metal fixtures in the home! We would love the opportunity to sit down and show you all of the woderful fabrics and options that we have to offer. Click Here to Schedule Your In-Home Consultation Today!